Fully equipped with a rich variety of functions. Thanks to Pure CF Sampling, 5-step AWM Dynamic Stereo Sampling and NW keyboard with synthetic ivory keytops, it gives an authentic impression of an acoustic grand piano. Super Articulation 2 Voices and other advanced features maximize the pleasure of performing. Offering a huge range of tones thanks to Pure CF Sampling* and AWM Dynamic Stereo Sampling. Pure CF Sampling gives CVP models a piano sound with superb tonal response and faithfulness to the original sound. They also benefit from AWM Dynamic Stereo Sampling, which samples sounds at up to five levels according to keystroke strength, allowing the expression of delicate sound nuances. In addition to piano sounds, as many as 1,291 other instrument sounds are available, so you can enjoy all types of instruments from strings to percussion while you’re playing the piano. * AWM stands for Advanced Wave Memory. Super Articulation Voices elevate your performance to new heights of realism. This amazing technology intelligently recreates the authentic performance characteristics of acoustic instruments, such as guitar fret noises and slides or the breathing of a sax player. They are then blended perfectly into your performance. Select any of the many Voices and enjoy an enhanced feeling of realism, as if that instrument was actually being played. The CVP-509 features Yamaha's unique Super Articulation 2 Voices. These automatically enhance your lead lines with the characteristic articulations of the original instruments, with no special playing techniques required. Sound that envelops you with a feeling of depth. iAFC* provides the benefits of advanced acoustic technology. The speakers inside the Clavinova body are used to create tonal resonances and a realistic sound field that makes you feel as if you are actually playing a grand piano. iAFC makes automatic adjustments to best match the characteristics of the room you are playing in. You can turn it on and off and vary the level. * instrumental Active Field Control. Tri-Amp System clearly resonates even delicate sound nuances. This advanced acoustic system projects sound from the speakers using independent amps for the high and low tone range, and the front monitor. It enables the clear expression of even delicate sound nuances. The sound will be heard more naturally, even at the player's position. A keyboard so well made, it feels like you're playing a grand piano. Yamaha's innovative GH3 keyboard has three sensors: in addition to two sensors to detect keystroke strength, it includes Yamaha’s original Damper Sensor. 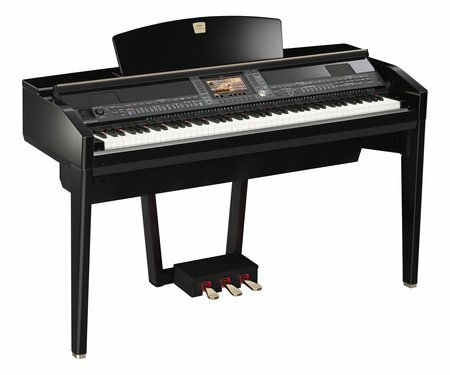 This enables you to use advanced techniques such as playing the same note repeatedly with perfect articulation, previously only possible on a grand piano, which blends sounds without the use of the damper pedal. You also enjoy the keyboard touch of a grand piano, including keys with weight gradations – heavy in the lower end and lighter in the higher end. The NW (Natural Wood) keyboard, with the same structure as the GH3 keyboard, and synthetic ivory keytops also provide the feel of a grand piano, even the fingertip sensations. Familiar pieces are even more fun to play, thanks to a wide range of selectable auto accompaniment Styles. A special feature of the CVP model is a wide selection of Styles that you can use for automatic accompaniment. All you do is play chords with your left hand, and you have your own personal backing band! You can add an intro or ending, or insert a fill-in. A maximum of 442 Styles are offered, such as Ballad, Dance and Country. The Styles use Mega Voices to ensure authentic, dynamic accompaniments. In addition, the Style guitar parts have been improved to provide even more natural guitar phrasing. Let Music Finder select the right style for the piece you want to play. Don't know the accompaniment Style or Voice best suited to the number you want to play? Music Finder is the perfect solution. You simply select a song title or keyword, and the appropriate Style, Voice and effects are automatically set. It’s like having a professional arranger help you out whenever you want. Music Finder+ lets you access a huge online library. Music Finder+ provides access to an online library of song setups that you can download directly to your Clavinova. The setups are free and available individually as Records or in convenient groups as Collections. The library offers over 4,000 Records and is constantly growing. You can search for your favorite songs and add them to your Clavinova. Music Finder+ also has useful Performance Guides that contain digital sheet music to help beginners learn how to play. Direct internet access. Quick access to a wide selection of musical data. With Internet Direct Connection and a LAN port, you have easy access directly from your Clavinova to a wide variety of musical data at a specialized website. Many services are conveniently available, such as finding and listening to a piece that you want to learn how to play. USB port further expands convenience. You can store performance data in an optional USB storage device using the To Device terminal, and connect the Clavinova to a PC via a single USB cable using the To Host terminal. USB Audio for recording your own performance. You can store your own performances, complete with singing (or playing a solo instrument) into a microphone connected to the Clavinova (or even an ensemble with a guitar plugged into the MIC. / LINE IN), in a USB storage device as an audio file. *1 These files can be used in a variety of ways, such as transferring them to a PC for friends to hear or using them to prepare original CDs. You can also play the audio files*2 and enjoy accompanying yourself on the Clavinova. *1 Storage format is WAV file. Large LCD is easy to see and understand. * Capable of handling lyrics and chord data recorded in standard MIDI files. Guide functions to support performance. A ball jumps along the musical notation shown on the display in time with the performance, letting you see where to play at a glance. Guide lamps show which keys to play next, and cause the accompaniment to wait until the correct note is played before moving along, making it easier to master a piece. The piano-like form with a modern finish is designed to fit easily in any room; for example, the speaker box has been slimmed down.